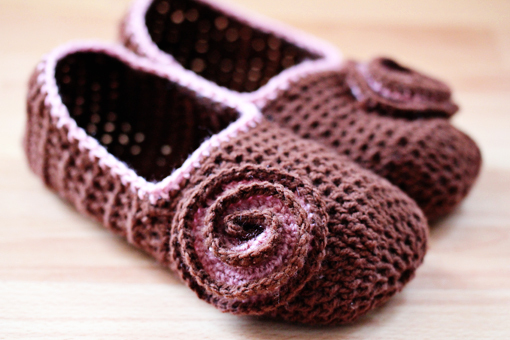 I’ve just finished making these slippers. 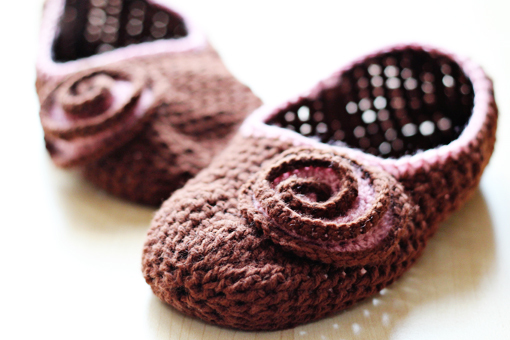 Making crocheted slippers is my addiction. One of the best things in life. What I also like is this little detail. Actually, I am preparing a tutorial on how to make a cute little thing like this. Oh, and there are more slippers like these to come. I have about 100 spare balls of yarn to use. I LOVE these. I made a pair of slippers for Christmas but they did not look so cute off the foot. And I love the swirly detail. Ooooh I certainly wouldn’t mind a tutorial! I would love to be able to make these… they’re fabulous! If you remember, on numerous occasions I took the liberty of expressing my eternal infatuation with your blog and your culinary and photo creations. This post, however, hits your blog out of the park. True: I enjoy cooking and eating delicious food. Looking at it via gorgeous pictures never hurts, either. But if you ever wondered off to my blog you know that my true passion lies with making stuff. Just like these amazing slippers. Oh, how sweet it is to be falling in love over and over again. These are so cute… I love them! Looking forward to the tutorial! Hi, Iam your fan love all your stuff, thanks for sharing, love crochet too,Ill be waiting for it. Happy New Year. Taketo papucky robievala moja babicka zo zbytkov vlny.. :)Na drevenej podlahe sa v nich dobre smyka. Your slippers are so cute…and you have cute feet too! I’m afraid that I neither crochet nor have cute feet. I wish I could. I can bake a thing or two but crochet is just too impossible. I actually design jewellery for a living and can string a mean strand of pearls but crochet is way too hard. I have always envied how people can turn a ball of yarn or two into something wonderful. You’re really all that, Petra. A gal who can cook, shoot and crochet. Super cute! I would like a tutorial if you get around to making one soon. Yes, I think it is possible. I am preparing a tutorial where you’ll learn everything. Oh, unfortunately I do not sell what I make at the moment. But maybe in future I’ll open an online shop, who knows. do you have a pattern i can have for these my gran wants to try them for me!! I could have used some of these last night; my feet were freezing! 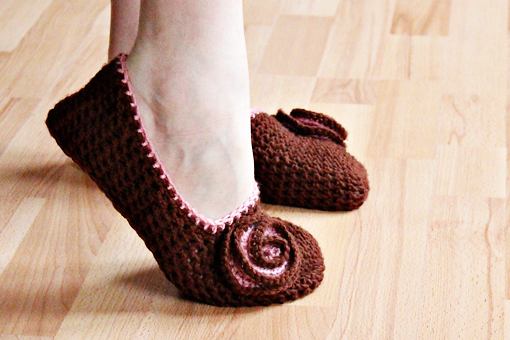 How about tutorial for the flower on these brown slippers? Thanks!!! 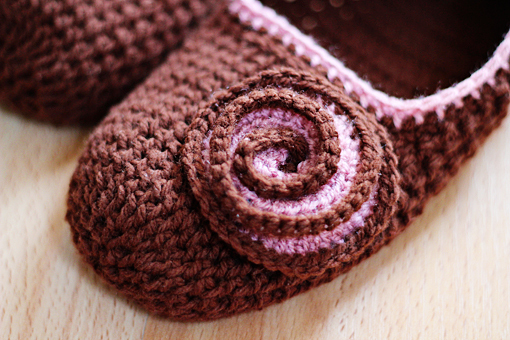 You can find the tutorial here: https://zoomyummy.com/2011/01/11/crochet-swirls-tutorial/. Hey! I love these! How did you do that swirly flower? I am dying to know! Did I seriously just write that? Oh my…oh my. I saw the link you posted previously just above my comment. Thanks so much! i pretty much squealed when i saw these. will definitely be making these over winter break! Thanks for sharing this pattern. These are just cute as can be! I too have a crochet addiction….love, love, love your patterns and thanks so much for sharing!!!!! I made my own slippers and they fit perfectly, everything is so cool about this 😀 thank you so much!!! the description and pics are perfect <3 tytytytyty!! The pictures & instructions are so clear to understand! Perfect tutorial! My 4 year old wants me to make him “fuzzy” shoes (crochet shoes) so here we go! Thank you-great work! These are the closest to the slippers my Great Grandma made that I have found. She made hers with a hook that my Gr. Grandfather made for her and said when it broke she wouldn’t make anymore. I really looked forward to my slippers for supper each year. I miss them and I miss her.